Albion boss Chris Hughton is just focusing on one game at a time in the race for promotion to the Premier League. 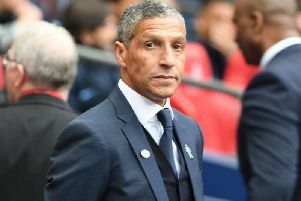 The Seagulls are one point behind leaders Newcastle in the Championship with six games to go but Hughton is not looking any further ahead than tonight's match at Queens Park Rangers. When asked it the title was an aim, he said: "You can't think about it. What we have to think about is a very tough away game tomorrow, followed by another very tough away game against two teams (QPR and Wolves) that are both in really good form. "You can't afford to think further than the next game because every week there are going to be ups and downs. The results (on Wednesday; Newcastle and Huddersfield winning) certainly show you that everybody is pushing. "The reality is we're still in a very good position, still pushing and we have a certain amount of games left to make sure we achieve what we want. But there are going to be ups and downs right the way through the season."